Welcome to Marvel Strike Force Heroes page. This is the full description of MSF Elektra stats, skills and abilities. Elektra is a HAND brawler who is specialized in assassination art. Her first skill deals medium damage to the target and applies Bleed. Her second skill deals moderate damage but clears positive effect from the enemy and grants Stealth to Elektra. Elektra ultimate assassinates the target for 530% of her base damage and when upgraded it can be cast in the second round of the combat. Elektra also provides her HAND allies with Evade at the start of each combat and she has a 10% chance to revive herself upon death. She is available for free early in the game when you start Villains United Campaign. Her shards can be obtained via Premium Orbs, 3-9 Heroes Assemble campaign mission, and 3-9 Villains United campaign mission. Attack primary target for 95% damage + 30% chance to apply Bleed. Attack primary target for 120% damage + clear 1 positive effect. Gain Stealth. 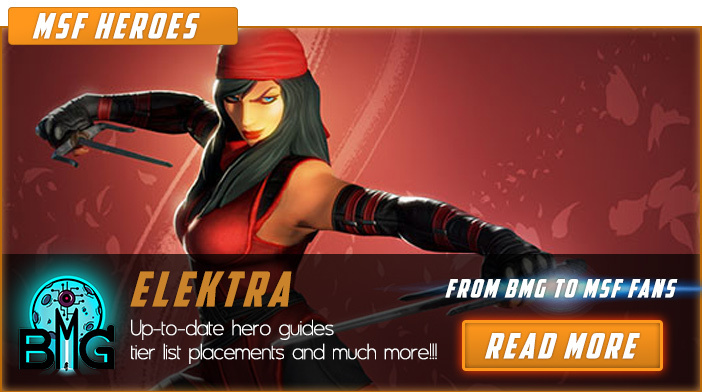 We hope that you enjoyed the description of MSF Hero Elektra. For detailed information about other MSF Characters check our MSF Heroes page.